Politics Trump credits people of faith for ‘abolition of civil rights’ at National Prayer Breakfast Dylan Stableford Senior Editor,Yahoo News• February 7, 2019 Misspoke? Trump says ‘abolition of civil rights’ one of America’s greatest ‘strides’ Delivering a speech at the National Prayer Breakfast in Washington, D.C., Thursday, President Trump stumbled while reading from a teleprompter and unintentionally credited “people of faith” for the “abolition of civil rights.”“Since the founding of our nation, many of our greatest strides, from gaining our independence to abolition of civil rights to extending the vote for women, have been led by people of faith,” Trump said at the Washington Hilton.Afterward, reports circulated that Trump’s speech script referred to the “abolition of slavery and civil rights.” Slavery ended with the passage of the 13th Amendment in 1865, a movement that was inspired and led by Christian preachers in the Northern states. Churches in the slaveholding South were mostly silent in the years leading up to the Civil War, or actively supported slavery as consistent with their interpretation of the Bible.The civil rights movement of the 1950s and 1960s, aimed at ending segregation and Jim Crow laws, also enlisted many faith leaders, both white and black. President Trump at the National Prayer Breakfast in Washington. (Photo: Kevin Lamarque/Reuters)Trump’s flub was noted on Twitter, though it’s unclear whether anyone in the room caught it.Trump did receive a standing ovation from most of the crowd when he talked about abortion.“All children, born and unborn, are made in the holy image of God,” he said. “Every life is sacred and every soul is a precious gift from heaven.”It was Trump’s third annual speech to the National Prayer Breakfast. At his first, in 2017, the president veered off script to ask those in attendance to pray for better ratings for Arnold Schwarzenegger as the host of NBC’s “The Apprentice,” an ironic way of calling attention to the fact that ratings “went right down the tubes” after Trump left the show.“I want to just pray for Arnold, if we can, for those ratings,” the president said.The show was canceled later that year. Scroll back up to restore default view.Although February is not even a week old, it’s already been a terrible month for Virginia Democrats as they attempt to assess the crises afflicting their top three state officials.The trouble began on Friday when multiple news outlets reported that Gov. Ralph Northam’s 1984 medical yearbook included a photo on his page of two people, one in blackface and one wearing a Ku Klux Klan hood and robe. Northam, who said he didn’t recall the incident and didn’t know which of the two unidentifiable people in the photo was him, nevertheless apologized, saying in a public statement, “I am deeply sorry for the decision I made to appear as I did in this photo and for the hurt that decision caused then and now.”But at a press conference the next day he changed his response, saying that after reflection he was sure neither of the figures was him, although it was his page and he appeared in the other images on the page. He then admitted he once darkened his face with shoe polish to dress as Michael Jackson for a costume party. (When a reporter asked if Northam could still moonwalk, the governor appeared to be preparing a demonstration before his wife suggested it was an inappropriate time.) The image on Northam’s page was apparently not an outlier, as the Eastern Virginia Medical School said it discontinued its yearbooks in 2013 because of a series of “shockingly abhorrent” photos.There have been calls for Northam’s resignation from across the party, including those of 2020 presidential hopefuls like Sen. Kamala Harris and Sen. Elizabeth Warren, both U.S. senators from Virginia (Democrats Tim Kaine and Mark Warner), Hillary Clinton, former Vice President Joe Biden and the NAACP. Northam has so far refused to resign, and the Washington Post is reporting that he is considering finishing out his term as an independent. Northam was elected in 2017, and Virginia governors are not permitted to serve consecutive terms.If Northam were to resign, Lt. Gov. Justin Fairfax would take over. Fairfax, 39, is African-American and considered a rising star in Virginia state politics. But on Sunday, the same right-wing website that publicized Northam’s photos reported about an accusation against Fairfax of sexual assault on a woman he met at the Democratic National Convention in 2004. He denied the charge in a statement on Monday.“Lt. Governor Fairfax has an outstanding and well-earned reputation for treating people with dignity and respect,” read a statement from his office. “He has never assaulted anyone — ever — in any way, shape, or form.”The Washington Post said it had investigated the claim when the accuser contacted them after Fairfax’s election in 2017, but that they were unable to corroborate it, or to find similar allegations against him. But NBC News reported Wednesday morning that Fairfax had profanely dismissed his accuser in a private meeting on Monday, saying “F*** that b****.” Democrats have yet to call on Fairfax to step down.On Wednesday afternoon, Fairfax’s accuser, Vanessa Tyson, issued a statement detailing her allegations and saying that she has no political motive, is a proud Democrat and that her only motive in speaking now “is to refute Mr. Fairfax’s falsehoods and aspersions of my character.”If both Northam and Fairfax were to resign, next in line for succession would be two-term Attorney General Mark Herring, who was first elected in 2013. 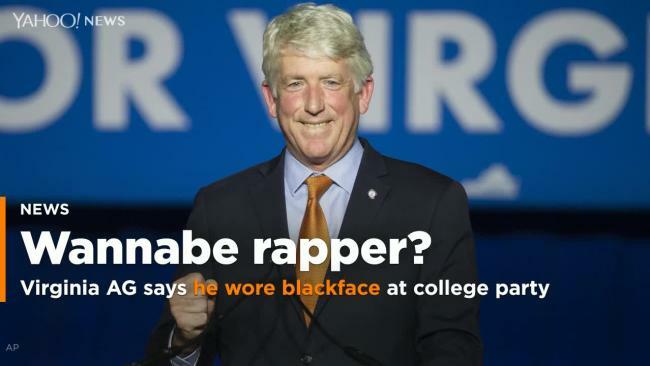 On Wednesday morning, Herring met with the Virginia Legislative Black Caucus and revealed that he had worn blackface at a college party.“In 1980, when I was a 19-year-old undergraduate in college, some friends suggested we attend a party dressed like rappers we listened to at the time, like Kurtis Blow, and perform a song,” wrote Herring in a statement released after the meeting. “It sounds ridiculous even now writing it. But because of our ignorance and glib attitudes — and because we did not have an appreciation for the experience and perspectives of others — we dressed up and put on wigs and brown makeup.””I had a callous and inexcusable lack of awareness and insensitivity to the pain my behavior could inflict on others. It was really a minimization of both people of color, and a minimization of a horrific history I knew well even then.”Herring added that it was a one-time occurrence for which he had felt shame for decades and in no way reflective of his current person. Herring had issued a statement on Saturday saying it was no longer possible for Northam to serve and that he should step down. February is also Black History Month.However, if Northam, Fairfax and Herring were all to resign simultaneously — an unlikely occurrence, but we’re covering our bases here — next in line for the governorship of Virginia is Republican Speaker of the House Kirk Cox. Cox became speaker after Republicans took control of the chamber by a single delegate, and won the race after a tied election led to drawing a name out of a bowl. Republicans also benefited from a map that was struck down in 2018 for being a racist gerrymander. A new map is expected for this November’s state legislative elections.Cox was a member of the James Madison University class of 1979. His yearbook has not yet been the subject of a public examination. Unfortunately, this video is not available in your region. „If I had not been elected president of the United States, we would right now, in my opinion, be in a major war with North Korea,” Trump said. Trump had raised fears of war in 2017 when he threatened to rain „fire and fury like the world has never seen” on North Korea because of the threat its nuclear weapons and missiles posed to the United States. „The two leaders already took their first step in Singapore toward shaking off their 70-year history of hostilities. Now we hope that they will take a step forward for concrete, substantive progress,” Blue House spokesman Kim Eui-kyeom told a news briefing in Seoul. It has also been used as a model of economic and political reform for impoverished and isolated North Korea to follow. That would require major changes to the North’s personality cult and „juche” ideology of self sufficiency. A source at Danang airport said four U.S. military V-22 „Osprey” aircraft flew from Japan’s Okinawa island and landed in the coastal city on Tuesday evening. They left after a few hours, the source said. U.S. Special Representative for North Korea Stephen Biegun was due to hold talks in Pyongyang this week to map out what he called „a set of concrete deliverables” for the second meeting. „If the United States can be more proactively flexible on that, it may draw other denuclearization steps on top of abolishing the Yongbyon facilities, and expedite talks on setting up a liaison office and replacing the armistice with a peace treaty,” Cheong said. While Trump has hailed „tremendous progress” in his dealings with North Korea, a confidential report by U.N. sanctions monitors seen by Reuters this week cast further doubt on the North’s intentions. (Bloomberg) — Russia welcomed an offer by U.S. President Donald Trump to renegotiate a landmark nuclear missile pact after he quit the agreement, while cautioning that it’s received no specific proposals yet. Trump said in his State of the Union address on Tuesday that the U.S. may be open to negotiating another agreement to replace the 1987 Intermediate-Range Nuclear Forces Treaty, one that could include China as well as Russia. The U.S. gave Russia written notice on Monday of its decision to withdraw from the Cold War-era accord, which bans deployment of short and medium-range missiles. The U.S. decision to withdraw from the INF treaty after accusing Russia of violating the pact, has fueled growing tensions between Washington and Moscow, and raised the threat of a renewed missile build-up in Europe. Ryabkov also warned that time is running out to begin talks on extending the other key nuclear weapons accord between Russia and the U.S., the New START treaty, before it expires in 2021. Negotiations must be wrapped up by the end of the year, before the U.S. enters a new campaign period for the 2020 elections, said Ryabkov, who expressed alarm at what he described as assurances by U.S. officials that there’s still plenty of time to resolve the issue. 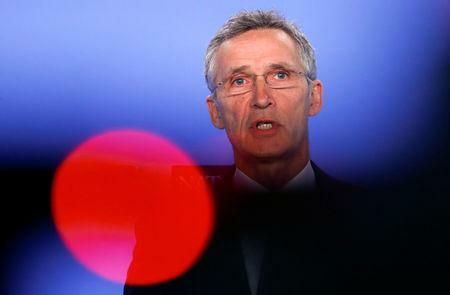 BERLIN (Reuters) – Germany must continue to increase its defenses spending despite having less wiggle room in its budget, NATO Secretary General said, after a government document on Monday showed the tax revenues were likely to rise less than expected in coming years. Germany has begun to increase its spending and it has to continue on this way, NATO Secretary General Jens Stoltenberg told Germany’s Funke newspaper group. „I understand that this is not easy and states prefer investing in health, education or infrastructure, but we have to invest more in our security if the world becomes more unsafe,” Stoltenberg said. The German government has assured NATO that it will stick to its aim of boosting defense spending to 1.5 percent of its gross domestic product by 2024, despite having less wiggle room in its budget, a German security source told Reuters on Wednesday. Puerto Rico’s government says 3,600 pounds (1,633 kilograms) worth of donated supplies are en route to Venezuela as part of a humanitarian aid mission. Officials said earlier Thursday that they had sent the supplies to the South American country. Puerto Rico Secretary of State Luis Rivera Marin said in an updated statement that a plane carrying the supplies left the U.S. territory on Wednesday but has not yet delivered them. Officials have said the humanitarian aid is not part of the $20 million in aid pledged by the United States. Venezuelan community leader Sonia Cosme told The Associated Press that the supplies including medication to help treat diabetes, blood pressure, asthma and seizures. There also are items for children including diapers, formula, milk, oral serums and protein drinks. The Venezuelan foreign ministry is saying that its websites have been hacked in several countries. „We have decided to stop publishing online content until cybersecurity has been restored,” read a message posted by the ministry on Twitter. The Venezuelan government admitted problems in at least Argentina and Mexico. The home page of the Venezuelan embassy in Washington appeared to be down for several hours on Thursday. 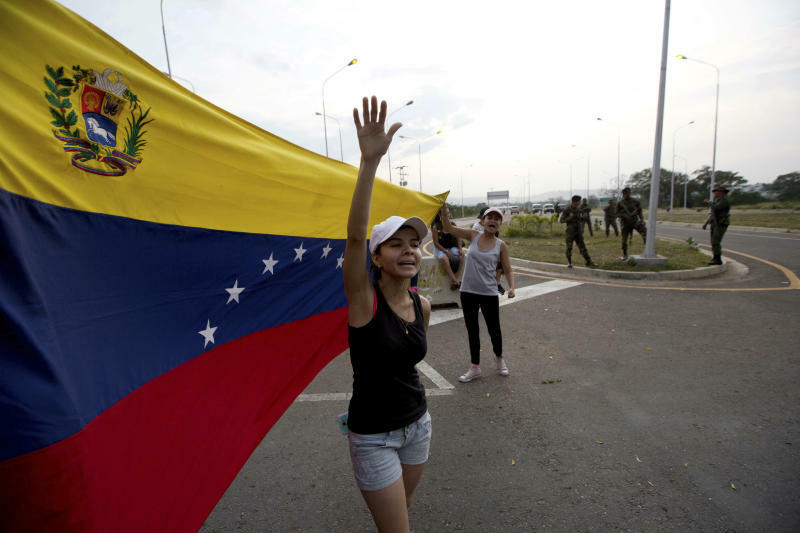 U.S. special envoy for Venezuela Elliot Abrams wants to see Venezuelan President Nicolas Maduro leave the country as he cedes power to a transitional government. Abrams tells reporters in Washington that the U.S. does not favor a specific country for Maduro to go to but notes that the embattled Venezuelan has „friends” in Cuba and Russia. Abrams says the U.S. has revoked visas for unnamed members of the Venezuelan Constituent Assembly as it seeks to continue pressing Maduro to cede power to opposition-controlled National Assembly leader Juan Guaido. The U.S. has recognized Guaido as the interim president. The end result of the second Trump-Kim summit will be a limited declaration of some North Korean missile and nuclear capabilities, and some acceptance of verification in exchange for a lessening of sanctions, aid package, and move towards normalization. South Korea’s Foreign Minister Kang Kyung-wha, the U.S. Secretary of State Mike Pompeo and National Security Advisor John Bolton all hinted in advance of tangible results, likely confirmed by North Korea’s representative during his visit to the White House. Donald Trump will hail the progress—on top of the continued missile and nuclear test moratorium—as a major foreign policy victory, and Kim will present himself internationally and for domestic consumption as a leader firmly on a global stage. South Korean President Moon Jae-in has provided the steady hand in the process. This will “begin” a process of denuclearization, but the devil remains in the details. How much of its weaponry will North Korea declare and which sites will it identify? And in exchange for what security and economic guarantees? It is likely that distance will remain in U.S. and North Korean definitions. A peace declaration ending the Korean War is likely, again with the behind-the-scenes reinforcement of South Korea’s Moon. The two could seize on it given the spectacle of a second summit, and Moon will want the two with him alongside China’s Xi for a grand statement in a historic setting. Washington will offer the “corresponding measures” (North Korean language) the DPRK is seeking by softening on sanctions, first through those needed for enhanced inter-Korean ties. Washington will maintain a strong line on overall sanctions but give somewhat on North Korean declarations and verification. An end-of-war statement, aid, and an opening of liaison offices are merely a matter of time. This is likely more than a short-term detente, but rather an opening of the unification tunnel, at least this year, when the political leaders of Washington, Seoul and Pyongyang are in alignment, all needing wins on domestic fronts. Stephen Noerper is a Korea Society senior director, Columbia University adjunct professor, and UN adviser. Damascus (AFP) – A convoy delivered aid to tens of thousands of displaced Syrians in desperate need of assistance near the Jordanian border on Wednesday, the first such delivery in three months, the Red Crescent and the United Nations said. It was the largest ever humanitarian convoy to reach the makeshift Rukban camp, the UN and the Syrian Arab Red Crescent added. The convoy of 133 trucks carried aid including food and children’s clothes, a SARC spokeswoman said. 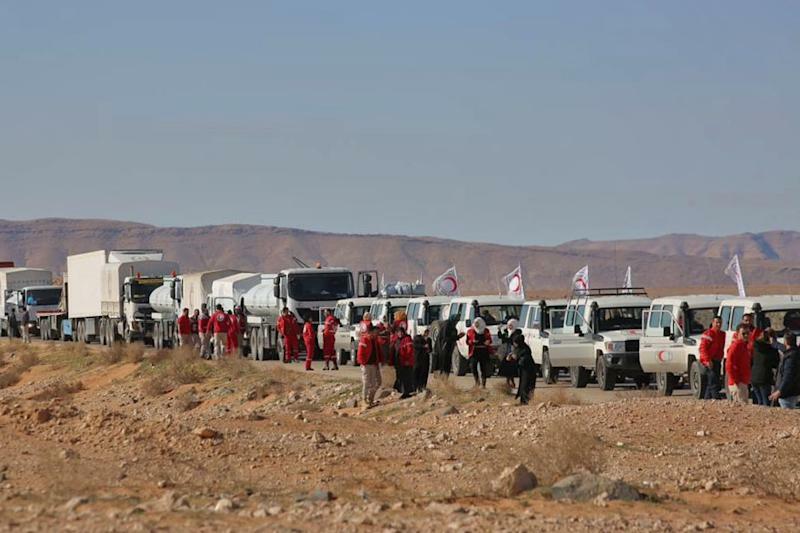 „Three months after a first humanitarian aid convoy entered the Rukban camp, the Syrian Arab Red Crescent in collaboration with the United Nations is continuing to carry out its duty towards more than 40,000 displaced people in Rukban,” SARC said in a statement. The aid also includes healthcare items and medical supplies, it said. „A vaccination campaign will be launched, under the supervision of a medical team, to immunise children against measles, polio, tuberculosis and hepatitis,” SARC added. The convoy contained vaccines for nearly 10,000 children under the age of five, the UN said in a statement. Wednesday’s delivery is the first to reach the camp on the Jordanian border since a smaller convoy from Damascus on November 3. Conditions inside the camp are dire, with many surviving on just one simple meal a day, often bread and olive oil or yoghurt, according to one resident. Last month, the UN children’s agency UNICEF said eight children had died at the camp due to winter cold. „This large-scale delivery of essential humanitarian supplies to the extremely vulnerable in Rukban could not have happened a moment too soon,” acting UN Resident and Humanitarian Coordinator Sajjad Malik said. But he stressed the need for a long-term solution. „While this delivery of assistance will provide much-needed support to people at Rukban, it is only a temporary measure,” he said. The camp, home to displaced people from across Syria, lies close to the Al-Tanf base used by the US-led coalition fighting the Islamic State group. Syria’s civil war has killed more than 360,000 people and displaced millions since it started with the brutal repression of anti-government protests in 2011. UNITED NATIONS (Reuters) – The United Nations warned on Wednesday against using aid as a pawn in Venezuela after the United States sent food and medicine to the country’s border and accused President Nicolas Maduro of blocking its delivery with trucks and shipping containers. U.S. officials said trucks carrying aid had arrived in Colombia for delivery to Venezuela at the request of Juan Guaido, who last month declared himself interim president. „The Venezuelan people desperately need humanitarian aid. The U.S. & other countries are trying to help, but Venezuela’s military under Maduro’s orders is blocking aid with trucks and shipping tankers,” U.S. Secretary of State Mike Pompeo posted on Twitter on Wednesday, along with a photo of a blocked road. Maduro’s government has denied that there is a humanitarian crisis, blaming economic problems on sanctions. Venezuela is struggling with hunger, preventable diseases and hyperinflation forecast at 10 million percent in 2019. Maduro said on Monday that Venezuelans were „not beggars” and he would not let the country be humiliated. The United States could attempt to seek the approval of the United Nations Security Council to deliver aid without Maduro’s cooperation, but Russia would likely block such a move. „Humanitarian action needs to be independent of political, military or other objectives,” U.N. spokesman Stephane Dujarric told reporters in New York. „When we see the present stand-off it becomes even more clear that serious political negotiations between the parties are necessary to find a solution leading to lasting peace for the people of Venezuela,” he said. Guaido wrote to U.N. Secretary-General Antonio Guterres last month asking for help in tackling the country’s crisis. But Venezuela’s seat at the 193-member world body is held by President Nicolas Maduro’s government and Guterres is unable to ramp up a humanitarian response in Venezuela without Maduro’s approval or U.N. Security Council authorization. Some 3 million Venezuelans have fled the crisis, the United Nations has said. „What is important is that humanitarian aid be depoliticized and that the needs of the people should lead in terms of when and how humanitarian aid is used,” Dujarric said. Most Latin American countries, Canada and about 20 European nations have backed the United States in recognizing Guaido. But these rapid endorsements have triggered angry responses from Russia, China and a few left-leaning Latin American states, and wariness from some African and Caribbean nations. 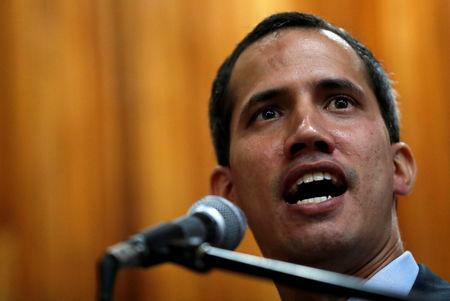 BRATISLAVA (Reuters) – Slovakia declined to recognize opposition leader Juan Guaido as Venezuela’s legitimate head of state on Wednesday, joining Italy in breaking the coordinated action of European Union nations and the United States. About 20 European Union nations including Britain, Germany, France and Spain have aligned with the United States in recognizing Guaido’s leadership and pressuring socialist President Nicolas Maduro to call a new election. „Slovakia should act within the principles of international law,” Fico said. Italy on Monday blocked a joint EU position to recognize Guaido as interim president, diplomatic sources said. Cúcuta (Colombia) (AFP) – Trucks carrying desperately-needed US humanitarian aid arrived at the Venezuelan border on Wednesday, AFP reporters said. 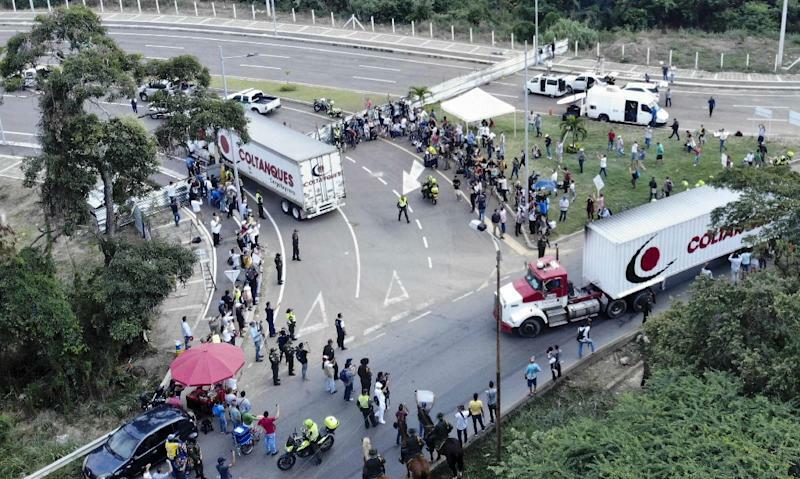 Several vehicles loaded with food and medicines rumbled into a collection center on the Colombian side of the Tienditas border bridge, which remains blocked by Venezuelan troops. President Nicolas Maduro has refused foreign aid shipments, saying they would open the way for US military intervention to depose him. His opposition rival Juan Guaido says up to 300,000 are in danger of death in the crisis-torn country for want of humanitarian assistance. 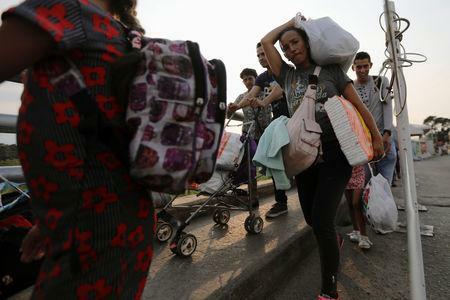 The convoy, which departed the day before from the city of Bucaramanga in northeastern Colombia, was cheered on its arrival by a group of Venezuelan migrants in Tienditas. Colombia’s Disaster Risk Management unit said it would stockpile the aid until shipments are authorized to cross into Venezuela. More humanitarian aid is expected „in the coming days” it said, including from Brazil and a Caribbean island it said still had to be determined. The airlines said in a statement that it was already in the process of removing the offending Diet Coke napkins from flights even before a social media outcry from passengers. This design was a flop, with the written suggestion, „Because you’re on a plane with interesting people and hey … you never know” featured on one side. The backside featured a spot for one to write a name and phone number. Napkins received from @Delta on Wednesday flight seem unintentionally creepy, especially after reading the smaller print. Swing and a miss, @DietCoke. The napkins will be replaced by „standard Diet Coke branded napkins found regularly on Delta flights,” according to the airlines.